The Gorkha National Liberation Front, which had supported the Trinamul Congress in the last Assembly elections, today said it would field its own candidates in wards it is strong even if the ally nominates somebody there. The GNLF, however, clarified it had not come out of the alliance but was taking a slightly different stand in the civic elections. Neeraj Zimba, the spokesperson for GNLF, said: "Our branch committees are surveying various wards. We have decided to field candidates on our own in ward where we feel our organisational base is strong. In such wards, we will give candidates irrespective of whether the TMC fields or not." In the last Assembly elections in the hills, Trinamul was in alliance with Jana Andolan Party and GNLF. Harka Bahadur Chhetri, the president of JAP, has said they would go alone in the upcoming civic elections. 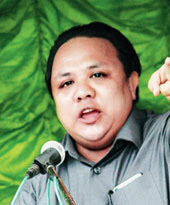 Zimba, however, clarified the party had not come out of the alliance with Trinamul. "We were in an alliance with Trinamul in the earlier elections because of various reasons. We are not coming out of the alliance as of now. We have only decided to field candidates in wards where we are strong," said Zimba. The GNLF said it was not necessary that it was trying to field candidates in all the wards of the four hill municipalities of Darjeeling, Kalimpong, Kurseong and Mirik. Zimba said: "Our priority is still to ensure that Morcha is removed from the hill municipality seats." The GNLF, however, is looking at a more symbiotic relation with Trinamul in the elections. "In the past, we have supported the TMC unconditionally. However, in elections to the panchayat, Assembly and Lok Sabha in the future, we will seek for a written assurance from the TMC to look into our demand for Sixth Schedule," said Zimba. The GNLF believes that in an alliance, all partners should benefit. "Earlier, we supported them unconditionally and the TMC gained out of it. In an alliance, all partners should get equal benefits," said Zimba. The hill party believes that it should not be a problem for Trinamul to make a commitment for the Sixth Schedule status as most of its leaders had earlier supported the issue. "Eight per cent of TMC (hill) leaders, right from their president Rajen Mukhia to working presidents N.B. Khwash and Shanta Chhetri were GNLF leaders who supported the Sixth Schedule status. It should not be a problem for TMC to commit to the demand," said Zimba.